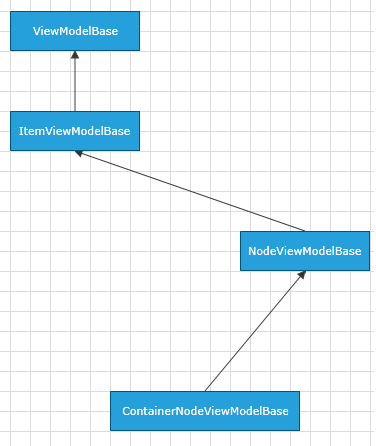 This article describes the ContainerNodeViewModelBase defined in the Diagramming Extensions. ContainerNodeViewModelBase is a ViewModel designed to serve as a base ViewModel for RadDiagramContainerShapes in a data-bound RadDiagram. The class is defined to expose properties that allow you to track and save the state of a ContainerShape in business models. It derives from the NodeViewModelBase class and implements the IContainerItem interface. ContainerNodeViewModelBase has a single constructor - ContainerNodeViewModelBase() that initializes a new instance of the class. InternalItems Gets the internal ObservableCollection of nodes that are wrapped in the container. Width Gets or sets a Double value indicating the Width of the represented shape. Height Gets or sets a Double value indicating the Height of the represented shape. RotationAngle Gets or sets a Double value indicating the rotation angle of the represented shape. Visibility Gets or sets the Visibility of the represented shape. The property is of type Visibility. Position Gets or sets the coordinates of a Point that represents the position of the represented shape. Content Gets or sets an object that represents the content of a shape. IsSelected Gets or sets a Boolean value indicating whether the represented shape is selected. AddItem Adds an object to the InternalItems collection. RemoveItem Removes an object from the InternalItems collection.